Talking therapy like counselling is still a bit of a mystery to many people. You might have questions like: Does talking therapy work? How? I feel terrible! How will talking about how bad I feel possibly make me feel better? I recently read a fantastic book by Susan David, a psychologist and faculty member at Harvard Medical School. 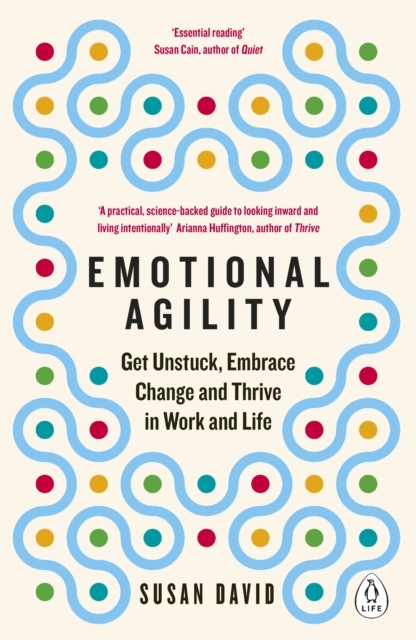 The book is called Emotional Agility and it does a great job of explaining why facing your feelings – particularly the more uncomfortable ones – can actually make you feel better. So what is emotional agility and what does it have to do with talking therapy? Essentially emotional agility is about paying attention to your feelings, facing them courageously and compassionately, and treating them as data to inform your choices. Emotionally agile people don’t ignore their thoughts and feelings or try to push them away. But they also don’t react to them without stopping to consider whether their actions align with their values. In order to do this, you need to first become more aware of your emotions. Then you need to learn to accept them, even the ones you might previously have thought of as negative, like sadness, anger, guilt or fear. From there you can become more flexible and able to respond – not react – to life’s challenges with confidence. Susan David describes this as “opening up that space between how you feel and what you do about those feelings” and explains how it “has been shown to help people with any number of troubles: negative self-image, heartbreak, physical pain, anxiety, depression, procrastination, tough transitions, and more”. We live in a culture of positive thinking. Have you noticed how rare it is to get an honest answer to “how are you?” Or how we British tend to apologise when we’re having a hard time… “sorry for being a downer”? But it’s not natural that anyone would feel great all the time. And there are actually benefits to lower moods. They encourage us to slow down. Pay attention to subtle details we might usually miss. Think things through more carefully. All of this can lead to better decision-making. In fact recent research has found that “instead of being purely a disorder, depression might be a specific behavioral strategy that we’ve evolved, a biological adaptation that serves a purpose… to make us stop, understand, and deal with an important problem”. When you feel sad, or even depressed, it is a sign that something is wrong. Often it can be that something doesn’t feel right about how you are living your life. The outward signs of misery can be a message to others that you need some support. If you try to hide your sadness from the people around you, you can miss out on their help. And if you try to distract yourself from going into it, you can rob yourself of that chance to slow down, reflect, and make the changes that you need to feel better. Our cultural silence around difficult feelings is so unhelpful. It gets in the way of us realising that everyone feels insecure sometimes. Everyone doubts themselves. And everyone is fectraid of failure. What makes those things easier to live with is facing them, naming them, and accepting them. But if you can find a way to listen to your more uncomfortable feelings and what they are trying to tell you, you can gain relief from them. It’s way more effective than trying to force yourself to cheer up. This includes your self. You’re OK just the way you are. And it’s OK that you want to change too. David goes on to suggest a great exercise for increasing self-compassion and self-acceptance. She recommends looking back at the child you once were and all the things you didn’t choose, like “your parents, your economic circumstances, your personality or your body type”. We all have to play the hand we’re dealt, and we all do our best under the circumstances. Can you offer that child warmth, kindness, forgiveness? Now how about the adult they grew into? Most of us grew up with the idea that at least some of the more uncomfortable emotions like sadness or anger are bad and must be repressed, denied, or at least hidden. It is pervasive in our culture, the idea that we have to do something about any inner turmoil: “struggle with it, fix it, control it, exert brute-force willpower over it”. It takes practice to develop the habit, as David describes, “to just welcome these inner experiences, breathe into them and learn their contours without racing for the exits”. But getting comfortable with being uncomfortable, accepting feelings without judging them as good or bad, can be hard to do, especially on your own. I can work with you to increase your awareness of your feelings and unpack what their messages are for you. When you learn to pay attention to your body, you will see how much it has to tell you about the life you want to lead. Feelings are brilliant at giving you information about what you do and don’t want, what hurts or feels threatening, and what you care about or want to work towards. One of the ways that talking therapy can help is by expanding your emotional vocabulary. When you put your finger on what exactly it is you’re struggling with, it can transform your experience of it. Distress that felt huge, confusing, painful and overwhelming comes to make sense and feel manageable when it has a name. I have a rich emotional vocabulary and a number or resources that we can use to help develop your ability to identify the full spectrum of emotion. Combining this with activities to gain clarity around your values and goals, we’ll start to see a way forwards. Are You Ready to Develop Your Emotional Agility? David uses the analogy of people who die in fires or crash landings often doing so because they try to get out the same way they came in. Under great stress, we all fall back on old thinking patterns. Emotional suffering and relationship troubles often work in the same way. Emotional agility and talking therapy are about seeing clear to find a new way, responding to your circumstances as they are now. Does that sound like an approach to life you would like to develop? Get in touch by email or call me on 07428 396671 today if you would like to see how talking therapy could help. You can also join my mailing list here.